JuJu is the latest project of Gioele Valenti of Lay Llamas and Herself, and the latest in a string of very fine releases from Sunrise Ocean Bender. 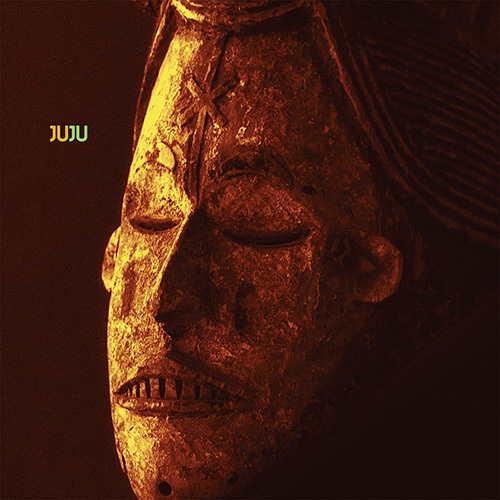 ‘JuJu’ the album tells the tale of an on-going exodus from Africa that more often than not ends in tragedy at sea. If that sounds a bit dour, fret ye not, it is an album full of character, ethnic flourishes and warm psychedelia. The Italian Occult Psychedelic scene, albeit a bit of a disingenuous tag, is hot property at the moment, with bands like the aforementioned Lay llamas, Heroin In Tahiti, Father Murphy etc all turning out albums full of sonic twists and turns and a melange of disparate influences. JuJu can be added to this list…..but regardless, it is an awesome album that, already, must be in the running for album of the year. Opening track ‘Samael’ is all throbbing bass line and vocals redolent of Depeche Mode at their very darkest. The bass really drives this track forward and is only eclipsed when the guitars occasionally break in . Sampled and treated vocals can be heard, sounding like the eponymous angel/devil. ‘We Spit On Yer Grave’ is straight out of the Jesus and Mary Chain book of reverb and wall of sound. The guitars are buzzsaw sharp and the drum machine never quits. ‘Stars And Sea’ starts with a simple beat and an acoustic guitar which give the track a folky feel, the gentle vocals match the guitar to evoke a ethereal vibe. The track is underpinned by some lush drones which only serve to compound the pastoral atmosphere…beautiful stuff indeed. Just when you’re getting comfortable it all steps up a gear; another wall of fuzz guitar and the drums take the tempo higher. There are some early eighties synth pop flourishes amongst it all…this one 7 minute track has enough about it to fill an entire album! ‘Dance With The Fish’ is a short exercise in hauntology …the simple piano, flashes of radio static and the old fashioned melodytransport the listener back in time; it is both foreboding and creepily innocent. A seamless segue brings the listener to ‘Sunrise Ocean’ which sees Valenti revisit the driving bass/reverb drenched vocals territory but this time round accompanied by flashes of ethnic chanting. ‘Lost’ has a sense of gravitas brought about by piano and drone complimented beautifully by guitar and almost inaudible vocals. The tune has timeless, hauntological quality about it, sounding contemporary but could have also been recorded years ago – a track in which to get truly lost. The album is closed by ‘Bring ‘Em War’ set up by a motorik, pulsing beat and gentle drones. Strident stabs of guitar and muted vocals are added to the mix before some luscious psychedelic guitar licks mark a tempo shift. The vocals have a shamanic quality about them and when the track coalesces it becomes a fusion of ethnic psychedelia that will leave even the most careworn of listeners feeling soothed and inspired..for me, the standout track. I cannot overemphasise how much I love this album…atmospheric and thoughtful and made with love and genuine craft. The melding of influences gives the album a well-rounded feel that leads the listener to exotic and fantastic places. It’s taken the enthnopsych of Vespero, the hauntology of Broadcast and the fuzzy reverb of JAMC and mixed them all up with lashings of imagination and robust mysticism. Last year Heroin In Tahiti was my album of the year…and another Italian production is going to be up there this year. The album will be available from Sunrise Ocean Bender; the vinyl from their Big Cartel site and the download from the Bandcamp site. Pre-orders start April 6th for a May 6th release date.